If you’re a parent or grandparent, you may have heard the phrase, “Eat your colors” on Sesame Street. Well, turns out that Elmo is right! One of the greatest colors to “eat”, and one that is a little tough for some to get down at times, is GREEN. Green vegetables are especially important for getting healthy levels of iron, an essential component for the body to carry oxygen through to all organs and systems. 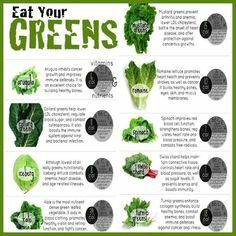 Green vegetables also include lutein, an antioxidant that reinforces vision. There are so many other benefits for these green, tasty, nutrition-filled veggies. Here are some really great recipes to try to get those greens in! Bottom line, eat those greens and find amazing ways to get them into your diet!!! Let us know what YOUR favorite recipe to use those greens is via the Facebook or Twitter discussion! And as a bonus, here’s a great chart that gives you nutritional information for many common vegetables.